The first seeds are sown! Somewhere deep inside of us all, the cycles of the seasons live. I know for our own little family, living here on the farm has awakened our own awareness of this quite a bit. But I believe that for all of us, our bodies and minds and our actions and energies participate in the cycle whether we notice it or not. For the last two months or so, the farmer has been sleeping in. Sometimes just sleeping in a little compared to being up and out in the fields before anyone else is awake; sometimes sleeping way in, while the rest of us rouse, eat, and start our day still waiting at 9:00 for him to say good morning! I am not quite sure if he has ever taken the winter months to practice this bit of extra restfulness before, or if this is just the first winter I noticed it. I do think that up until now he most likely still had a pressing feeling in the winter to keep busy because this is the first winter that he has been all the way through a full year of full-time farming, with the business now more or less solvent without needing either of us to work off of the farm. I think this year he could fully relax while the sun slept in too and the temperatures were so cold. I, too, have noticed that even though I wasn’t sleeping in, I was feeling more sleepy when I did wake in the mornings. There was a subtle difference–less get up and go and a lot more snuggle under the covers than jump up and greet the day. Since neither of us have changed our sleeping routines, I can’t help but think that this extra sleepiness has something to do with the season. And then this morning, I woke early to the sound of the farmer leaving the bed. I could see that there was a faint change in the color of the sky, but really, it was mostly dark and dawn was barely on its way. After falling back asleep for a little bit before getting up, I went out to find that this morning, all of a sudden, the farmer was back to work. He had finished his tea, organized seeds, and was heading out the door already, practically bristling with excitiment. He said something about so much to do! and was off to the greenhouse. At first, I was surprised at the sudden change, finding myself equally bristling with excitement at early morning work and all that it implied , but nevertheless, not fully there myself in that get back to business mode. And then I was struck by the significance of this shift happening today, the day pagans used to celebrate as the halfway point between the darkest day of the year, winter solstice, and the first day of spring. Imbolc, an ancient holiday, encompassed in modern times by little more than a groundhog peeking out of his whole in Pennsylvania (tomorrow), but still a nod to the fact that spring is, indeed, on its way. The energy has shifted outside as it will continue to shift throughout the month and on into the heart of spring. And without skipping a beat, the farmer, so very connected to this land and his work, experienced that same shift. Just like that, he shed his winter slumbering and awoke with excitement and enthusiasm–it is the perfect energy to jump start the season. 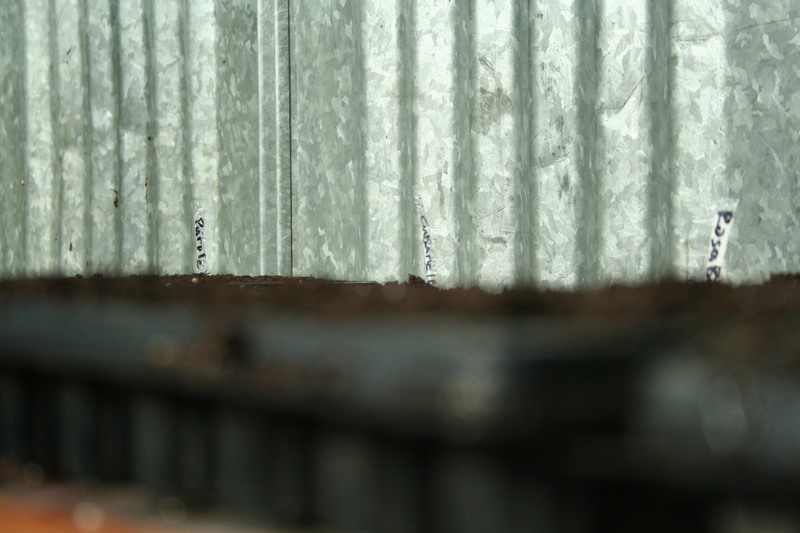 And so, early on this Imbolc morning, some seeds were sown, the first of 2012.